Anatomy 4D is an excellent iPad app for science teachers and students. It provides an interactive 4D experience of the human anatomy using augmented reality technology. Anatomy 4D offers an easy to use 3-dimensional learning environment ideal for classroom use. Students can utilize the app to virtually explore the human body and learn more about the functionality of each organ. 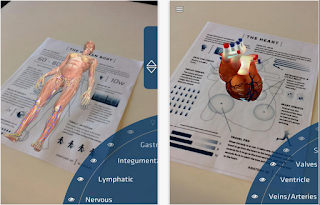 The visual and interactive features of the app make the task of learning about human anatomy super engaging. First, open the app and head over to ‘target library’ and email, print or save any set of images you are interested in. After that, you simply point your device at the target from the “Viewer” and watch the 4D Experience come to life. Get inspired about human anatomy!